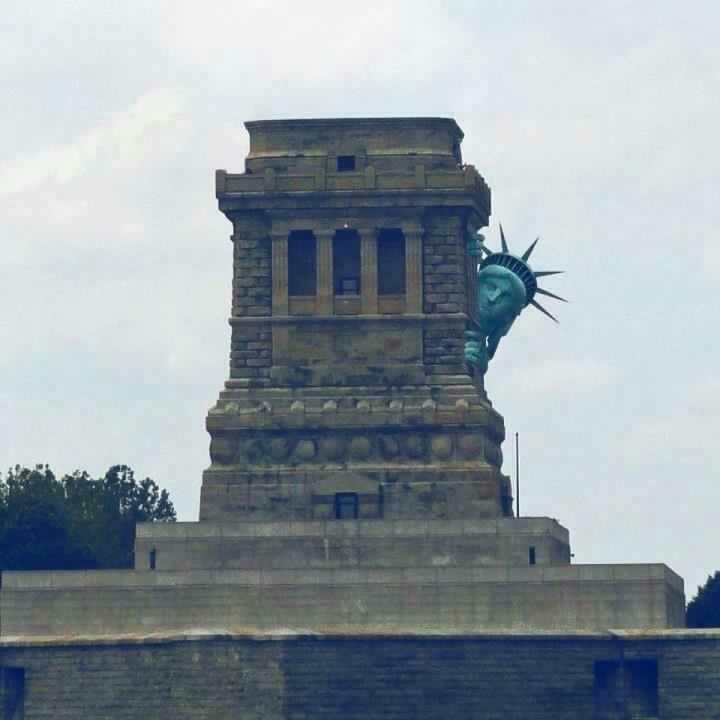 Any pie in a Frankenstorm. 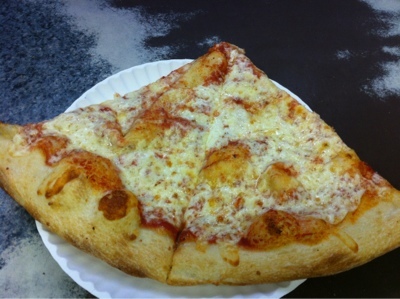 Whether you're in a hurry because you are running late for an engagement or making preparations for an impending hurricane, 99¢ Fresh Pizza is the perfect 'round-the-clock option for a cheap grab-and-go slice. And I mean "cheap" in every sense of the word. 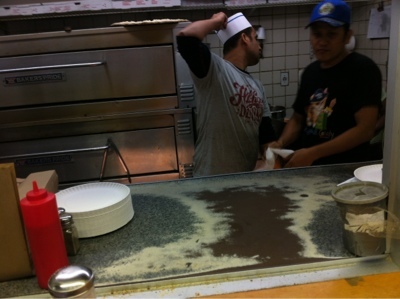 There is no dining area, no restroom, not many topping options, and I don't think the men stuck behind the 3'x6' greasy, well-worn counter speak fluent English. 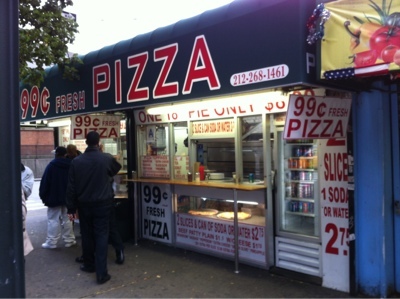 Furthermore, the ingredients in the gas-powered deck oven slices must be amongst the least expensive in order to make a profit on a dollar slice. 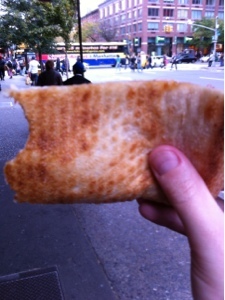 That said, the slices at 99¢ Fresh Pizza taste decent because they are freshly out of the oven. They are also thoroughly salted and sweetened to cover the acidity of the spared-ever-expense component parts. The bubble-filled outer edge and underside are soft and doughy due to having been removed from the heat prematurely to accommodate the high volume of demand for the inexpensive product. 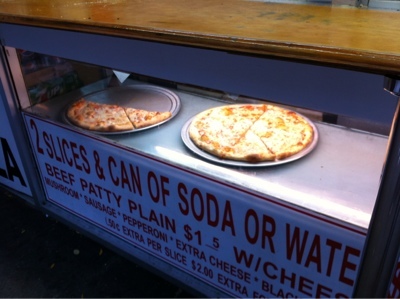 At this particular location, expect to be accosted by panhandlers, some more aggressive than others - yet another reason to get your slice and go. When I'm hungry and running low on time and money, I will be back. 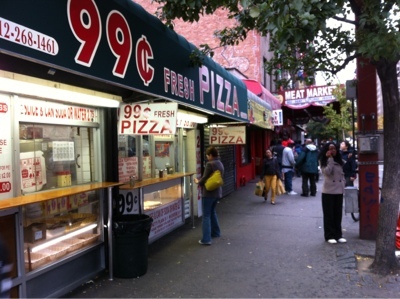 After all, 99¢ Fresh Pizza offers one of the best deals in the city. 1. 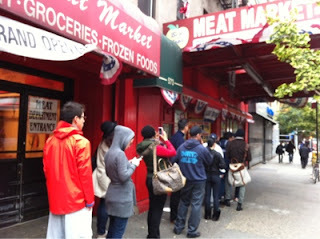 Robin and I ate at 99¢ Fresh Pizza while waiting in line to go into our local grocery store, the Big Apple Meat Market. There usually isn't a line to get in but, then again, there usually isn't a hurricane bearing down on us. 2. I thought this was a funny photoshopped image of Lady Liberty bracing for Hurricane Sandy.